Therm-a-Rest Neck Pillow. 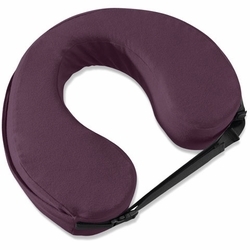 The venerable neck pillow is a friend of many weary travelers. It's built with a conforming Isotonic® Memory Foam interior and soft, machine washable polyester cover. A new shape reduces volume in the back and adds some volume to the front lobes, allowing for a more natural and comfortable head position. The whole pillow compresses small with an integrated, hook and loop compression strap for easy storing in your carry-on bags, or even just the back seat on long road trips.